Running back Latavius Murray and his Minnesota Vikings rolled past the visiting Baltimore Ravens in impressive fashion on Sunday. Murray rushed for a season-high 113 yards and one touchdown on just 13 attempts, carrying the Vikings to an easy 24-16 win. Jerick McKinnon also added to Minnesota’s rushing attack, totaling 47 yards on 18 carries. Opposite to Murray & Co., the Ravens’ backfield couldn’t find any room to run against the Vikings’ defense, as Alex Collins and Javorius Allen combined for just 50 yards on the ground. Making matters worse, quarterback Joe Flacco didn’t do much to help his struggling rushing attack through the air, completing just 20-of-29 passes for 186 yards and a garbage-time touchdown to Chris Moore as time expired. Defensively, linebacker Eric Kendricks led the charge for the Vikings. The former UCLA standout totaled a team-high 12 combined tackles (10 solo). With that, we give you our PFF exclusive takeaways from the contest for each team. Reiff had a day against Terrell Suggs, yielding one total pressure on 27 pass blocking snaps. He added some fine work in the run game for his highest-graded game of the season. Both tackles get credit, where credit is due, simply because of how much they fueled the offense in this one. Remmers was also responsible for just one lone hurry and cleared the way for multiple big runs. The Vikings averaged 9.1 yards per carry on eight runs that hit off the right edge. It’s become almost yawn-worthy at this point to see Joseph’s name here. He was an absolute handful for the Ravens interior offensive linemen and impacted both the run and pass. He tallied three stops in the run game and two pressures on 23 pass-rushes. After an oddly poor 2016 season, Barr looks back to his best of late. He tallied a monstrous seven stops in this one as he was constantly around the ball for the Vikings. He once again didn’t miss a tackle and hasn’t missed one since Week 2. The Vikings defense has been giving opposing quarterbacks fits all season and Flacco was no different. Of his 27 completions, only three were 10-plus yards down the field. On Flacco’s 11 pressured dropbacks, he gained all of seven yards through the air and took five sacks. The loss of Marshal Yanda was felt mightily in this one. Eluemunor was a liability from the first snap to the last. He allowed a sack, two hurries, and commited two penalties on the day. This is the type of impact they were hoping for when they signed Carr from Dallas this offseason. He was targeted six times, allowed only three catches for 22 yards and snagged an early interception. Much of the Ravens’ struggles in run defense can be traced back to the play of Onwuasor. 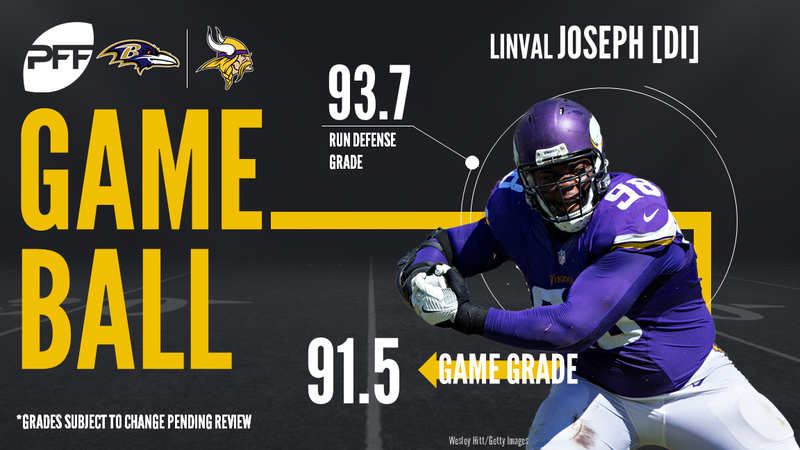 The second-year linebacker was hesitant snap-after-snap versus the run and couldn’t quite make heads or tails of the Vikings rushing attack. He also missed two tackles on seven attempts.